With over forty years of X-Men stories to draw from, there is an endless repository of mutants and their history for Marvel to create sequels and spin-offs of this successful movie franchise. They chose wisely. With Bryan Singer back at the keyboards and the choice to feature the founding of the X-Men clan, the series regains the emotional resonance of the first two X-Men movies and delivers the kind of thrilling, coded political action-packed potboiler we’ve come to expect. This film flashes us back to 1962 (and even farther, to fill in the origin story for Magneto (Michael Fassbender) and Dr. X (James McAvoy)), before the X-Men existed but mutants roams wild causing trouble. One particular mutant – Sebastian Shaw – has the power to absorb and deploy energy at his will, and is bent on starting World War Three (in a comic book, alternate reality version of the Cuban Missile Crisis). As it happens, Eric Lehnsherr (yet to become Magneto) has a blood feud with Shaw, and is hunting him down to kill him. An intrepid female FBI agent is also on the case (MacTagertt), and when she teams up with the young Dr. Xavier and a CIA agent who happens to have a prototype of the device called Cerebro, all the ingredients are in place to start drafting the first X-Men class. What is fabulous about all this is that this film gets just the right cultural ingredients into its pop-corn-flick cocktail: a clearly gay-coded discourse on mutant pride, a splash of retro Sixties brat-pack chic, and a twist of Men in Black, all over a bit of rocks in the personage of Emma Frost (January Jones of “Mad Men” fame), a steely dame who can read minds and turn herself to diamonds. While many summer movies seem like an unimaginative rip-off of the last few stories of recent years, with X-Men First Class, one gets more of an entertaining gloss of the moment, combining style elements from "Mad Men" and Tarantino with "True Blood," "Glee," and Bond, but in the service of its own original X-i-fied story. Sets like the “war room” and the Sixth Fleet are inspired by our cultural memory more than the real thing – looking more like Dr. Strangelove and Das Boot than anything from reality. This is why the insertion of real-life clips of Kennedy feel so false, in one of the film’s few wrong moves. At the heart of this story is the emotional growth of the character of Magneto. Rumor has it that the originally planned release for this year – a full Magneto movie – was superseded by this flick, which combines Magneto’s back story with Dr. X and gives us a full class of original, teenage X-Men just learning about their powers, including Mystique, Havoc, Banshee, and Beast. But it’s still Erik Lehnsherr’s story that drives the arch of the film. Lehnsherr’s mother was killed in the Nazi camps by a younger Shaw (or older, since he gets younger as he gets more powerful). The murder of his mother unleashes Lehnsherr’s powers by tapping into two powerful emotions: anger and pain. The subsequent effect of Lehnsherr manipulating all the metal in the room gets to the core of what makes these movies work so well: the external representation of an internal emotion. When those filing cabinets get crushed and the metal knives and tables go flying we see exactly what Lehnsherr feels in that moment, and it’s powerful and brutal. And as any good cultural studies student would discern, the external superpowers of the characters in this series are also a manifestation of their subconscious egos. When Lehnsherr raises the submarine from the depths of the ocean only through the force of his will, we know it symbolizes his raising of his subconscious, integrated self. The audience may not read this in so Freudian a way but the symbolism is powerful, and everyone feels it, nonetheless. Dr. X, then, is kind of the group’s psychotherapist, coaching each of the members to their full selves. Havoc’s inability to control his cosmic ray blasts is the perfect metaphor for the sloppy havoc of teenagerdome, and Dr. X is here to teach these kids the control necessary to become functioning adults. More than the ego-driven Wolverine movie, First Class focuses on the team again, and especially on the developing friendship between Magneto and Dr. X. Singer has always been more at home telling ensemble-driven stories. Even if it doesn’t have the ‘cool mutant’ effect of Wolverine, such dramatic interplay between the main characters gives this film more resonance. Xavier brings the necessary rationality and focus to train his charges, including the anger-filled Magneto. 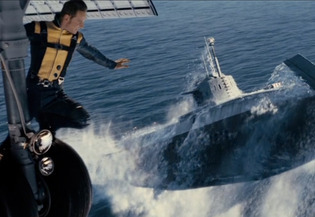 The scene in which he captures a memory of Lehnsherr’s mother and teaches him to use that sense of “serenity” to improve his skill and range is not only well done; it’s the movie’s emotional core. The application of rationality to raw pain isn’t a bad lesson and the movie delivers it with both grace (Fassbender and McAvoy shine most in this moment) and the necessary visual flare. After this high point, however, the movie races into its third act with little time for subtlety. My one irritation with the film is how tightly it’s been edited – there’s no time to breathe between scenes, and the rushing adrenaline of the music never lets up. As we rewrite the history of the Cuban Missile Crisis and race into the final battle between mutants, too little time is left to fully develop the climax. Shaw is dispatched in a thematically resonant – but most unsatisfying – way (he isn’t able to put up any fight, which is disappointing given all the potential energy he just absorbed, literally). Meanwhile, characters choose up sides and obvious dialogue opportunities are missed as the movie races to complete itself in the audience-tested time limit. And while Magneto’s arch is well completed and bits of familiar trappings are filled in, we never really get to see how Xavier became the man he is on the inside. Adding five minutes of scenic transitions to the last half hour of this film would have served it well. However, enough is packed into this confection of angst and superpowers that it’s worth seeing twice – as any good summer blockbuster should be. In a 2011 summer season filed with tent pole series blockbusters, it may not be the most original, and certainly not an out-of-the-park masterpiece. But it’s a solid hit to second, which is a great way to kick off the season.